Ralph Nader and Whether NPR Ignores Progressives : NPR Public Editor NPR is constantly hammered for allegedly being liberal, but last week I met with Ralph Nader to hear his complaints. He thinks NPR is not just too conservative, but that what liberals it does have on the air are too middle-of-the road. How can I measure this? 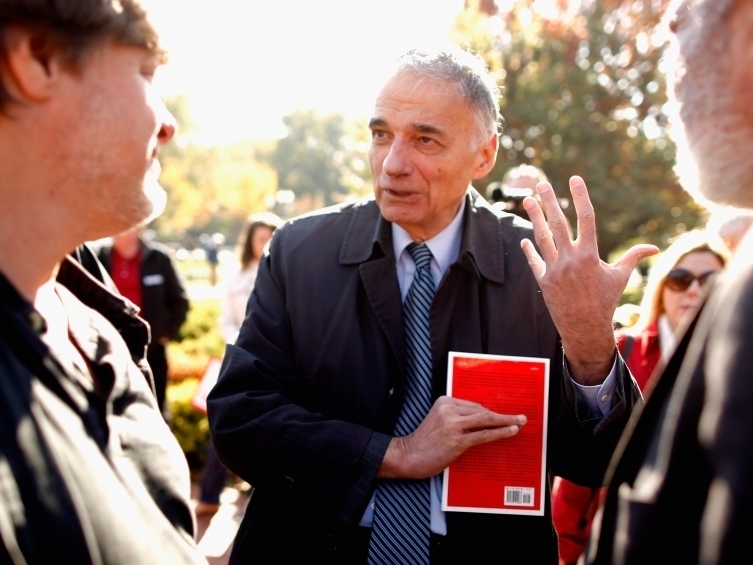 Political activist and former presidential candidate Ralph Nader talks with labor leaders at a rally Washington, D.C., on Nov. 3, 2011. Nader, a five-time presidential candidate, has been calling me in recent months to hold my feet to the fire, and so I went to meet with him. While the political right has been beating the drum for years that NPR is too liberal, Nader says that is not the true picture at all. He says that it is progressives on the political left, like him, who are being excluded from NPR's airwaves. "Progressive voices are not heard on NPR with the frequency of voices representing more corporatist and conservative opinion," Nader said. "And progressive voices should not be confused with liberal voices and lumped into the same category for any frequency analysis." Nader does make at least one good point. Academic studies in recent decades have repeatedly shown that the country's political right, more than the left, is so peopled by true believers driven by principle that they reject political compromise and stay on message with such a strong voice that it attracts great media attention and exaggerates their real weight in the populace. "Most of the Liberals in Congress voted for the Patriot Act and its renewal," Nader said, citing another policy differentiator. He said progressives more than liberals also want to dramatically increase minimum wage and decrease the country's military involvement abroad. He said that in listening to the radio, it seems to him that NPR is increasing the diversity in its coverage when it comes to gender and race, which he applauds. But he said it is overlooking a diversity of political ideas. Coverage of the current Republican primaries is particularly assuring that what he calls both the more moderate "corporatist" right and the more hard-core conservative right are getting plenty of air time. I am not quite sure how to measure appearances by people representing these very real but still fuzzy distinctions. Where do you draw the lines? Is there a master list of voices? I have enjoyed following the thoughtful conversations in these open forums, and so it occurs to me to ask you for your ideas. All responses are welcome.